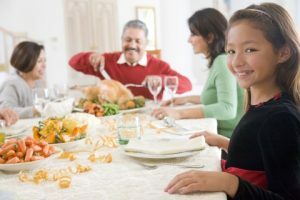 Make this year’s Thanksgiving celebration about your whole family! #3. Let them help you in the kitchen. Preparing the Thanksgiving meal can be a pretty big job, but there are lots of little tasks that kids can handle. Getting your kids involved in the cooking will make them all the more eager to eat the meal, plus cooking helps kids to learn about fractions, addition, subtraction and so much more! Cooking will also keep them busy, so that they aren’t constantly asking you when dinner will be ready, and you won’t have to try to keep them entertained while you are busy cooking. #4. Ask them to set the table. Setting the table is an easy task that kids can do from a young age. They can put the tablecloth on, place the napkins, add the silverware and they can even set up your centerpiece! Just leave the expensive, breakable stuff up to the adults. #5. Get them involved in cleaning up. Cleaning up is everyone’s least favorite part about Thanksgiving, but it has to be done. It’s never too early to teach your kids about the importance of cleaning up, and again, there are lots of little tasks that you can have them do.